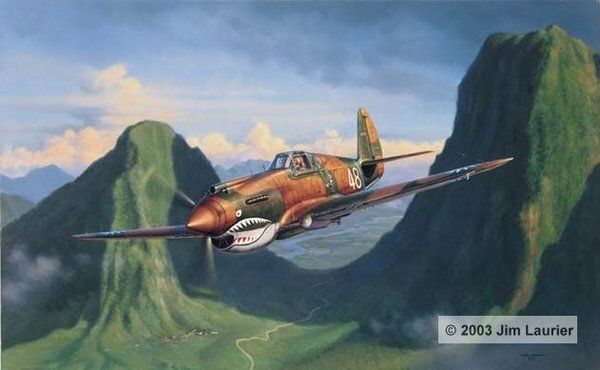 David Lee "Tex" Hill is shown flying a Curtiss P-40B Tomahawk through the rugged terrain of south west China as he heads for the airstrip at Kweilin. His P-40 is wearing what is probably the most recognizable paint schemes of World War Two - the famous shark face design of the "Flying Tigers". Officially known as the American Volunteer Group, or A.V.G., the Chinese gave the group their name "Fei Hu", or "Flying Tigers" in Chinese. While serving with the A.V.G., Tex commanded the second squadron who were nicknamed the "Panda Bears". Most of the aircraft in the second squadron carried a panda bear cartoon drawn in black and white on the fuselage by pilot Bert Christman, who was an artist before he signed up with the group. Tex's panda bear is dressed as an old west cowboy, since Tex grew up Texas, and his aircraft was number 48. The second squadron also carried a blue band around the rear fuselage. The wreckage of a Japanese Ki-43 "Oscar" fighter lies in the mountain pass below. The Oscar was the type of fighter most often encountered by the A.V.G. during their tour in China.